Please note in the note to seller the turning Age and Name of the Celebrant upon checking out. 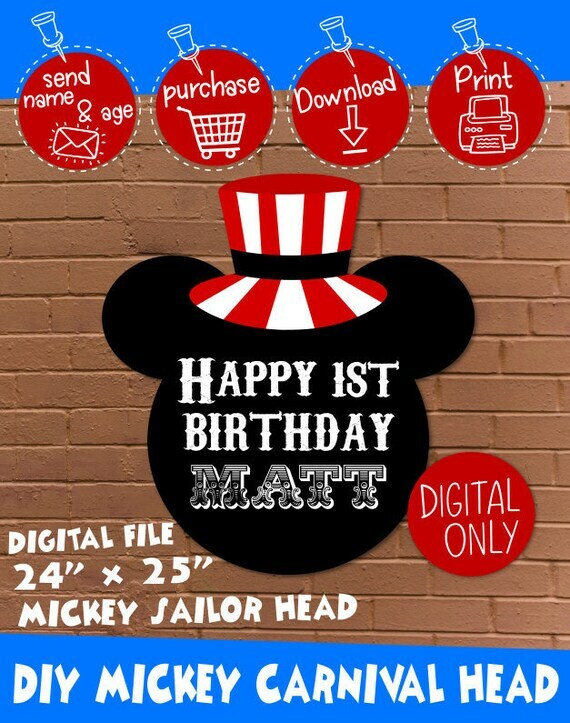 -- 24" x 25" with customized text Mickey Mouse Head DIGITAL FILE in PNG and PDF format. Files are High Resolution PNG and PDF 300dpi high resolution no watermarks. Files will be available to download 1-2 business days after payment. Due to the digital nature of products, all sales are final. There is no return or exchange. Please convo/message me here on etsy if you have any issues or concerns with your order and I will do my best to find a solution. A download link will be emailed to you here on etsy, to the email address associated with your etsy account, and to your paypal email address. I always email orders not later than 2 business days, most of the time I email orders earlier than 24 hours but never later than 2 business days, so kindly please check your etsy convo/messages if you think you haven't receive your download link yet. There may be a delay during off hours (nighttime, weekends) and holidays. Rest assured that I will email your order as soon as possible. *NO COMMERCIAL USE or RESALE. **By purchasing you agree to these terms. Please keep in mind that printers and monitors display color differently. There are a lot of factors that affects color variations (monitor display, printer settings, you may be running low on ink, printer output, etc, ) so the colors you see from your screen may be a little different when printed. I will not be responsible for color variations. Please work with your printing company. I do not claim ownership of the licensed characters. My fee is only for the time spent customizing for you. These are digital designs that you print on your own or have them printed at a local printing shop. I am not responsible as to where in your area or places you can have this printed, I only customize/personalize and provide the design for you in digital form and printing is your responsibility. Copyright restrictions on the characters only permit graphics to be used for one time personal use such as birthday parties.There will be no copyright release from me. If you have issues with a printing shop/lab refusing to print for you because of copyrights issues, please try another printing shop/lab or print at home. No refunds will be given for printing issues. This item is not a licensed product, all character images used are free and not being sold.All copyrighted and trademark characters belong to their respective copyright and trademark holders.